Cassava (Manihot esculenta Crantz. ), also commonly called manioc, originated in South America and is now extensively cultivated in more than a hundred countries in tropical and subtropical regions of the Americas, Africa and Asia. It is grown primarily for its edible starchy root and is the third-largest source of food carbohydrates in the tropics after rice and maize. It provides the basic staple diet for more than 500 million people. In addition, cassava leaves and young shoots are used as a leafy vegetable, providing a valuable source of protein and vitamins. 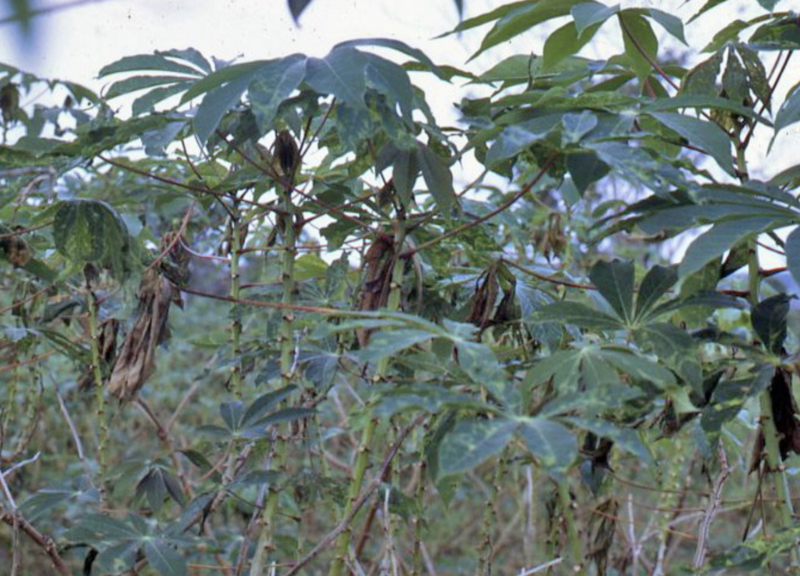 Cassava is one of the most drought-tolerant crops, capable of growing on marginal soils. The roots can be left in the soil until needed, obviating the need for set harvesting periods and large storage facilities. Cassava roots and leaves contain anti-nutritional factors and toxins (cyanide), so it must be properly prepared before consumption. Failure to prepare appropriately can leave enough residual cyanide to cause acute poisoning and even death. 1. 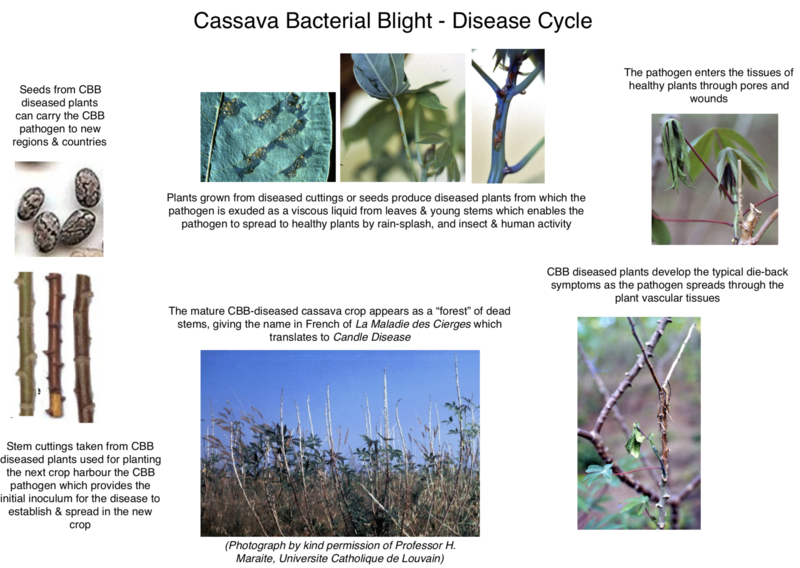 How important is cassava bacterial blight? • in Zaire in the early 1970s, the losses due to CBB were estimated at 75% of its tuber yield and almost all of its protein-rich leaf yield every year for several years, causing severe malnutrition and even starvation. 2. How is CBB Identified? The first sign of the disease is wilting and dying of leaves (Photo CBB 1 & 2). 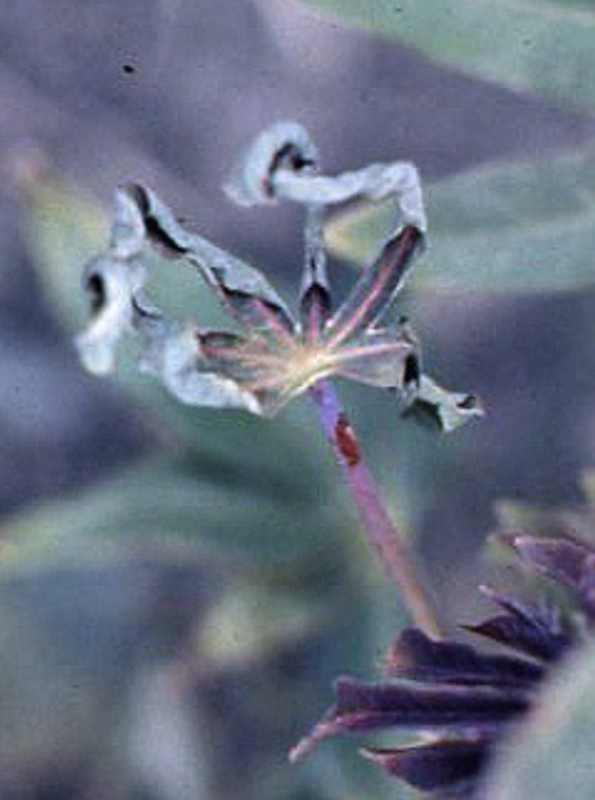 The leaf wilting is accompanied by a viscous amber to orange coloured exudation from the leaf stalks (petioles) and young stems (Photos CBB 3 - 5). 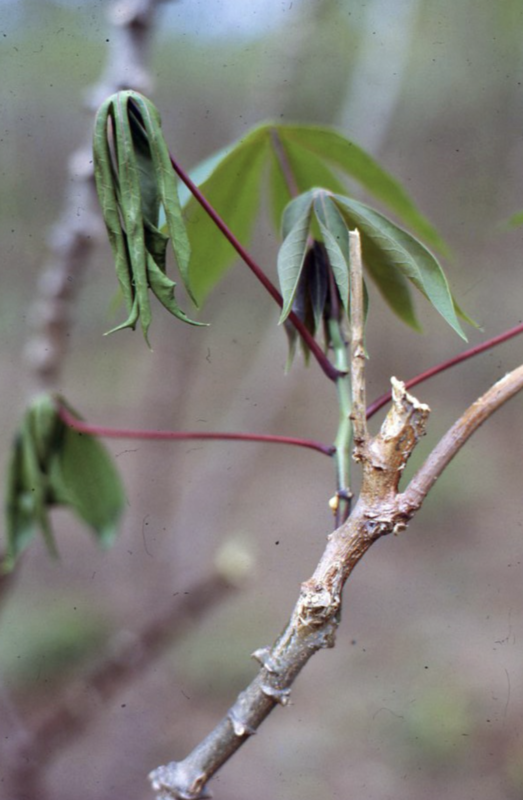 As the disease progresses the diseased shoots die so that the plants show the characteristic “dieback” symptoms, with bare leafless stems pointing upward (Photo CBB 6). 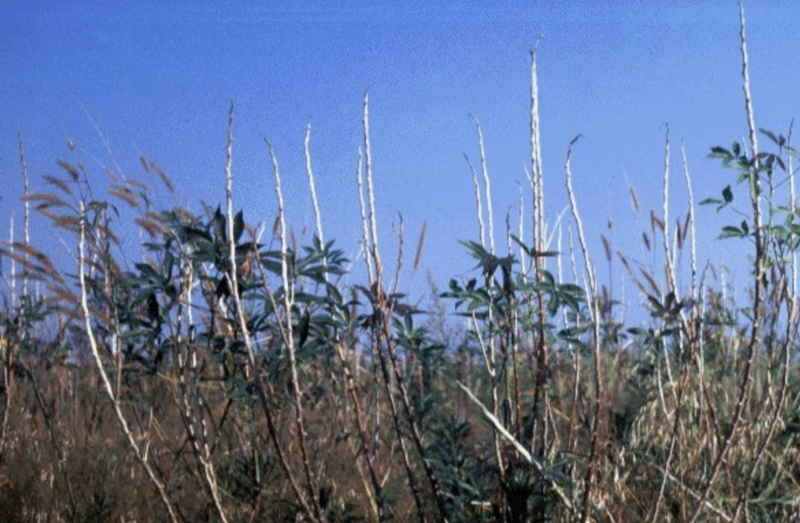 When large numbers of adjacent plants exhibit the dieback symptoms, the crop appears as a forest of leafless stems which gives rise to the name in French of “la maladie des cierges” or candle disease (Photo CBB 7). 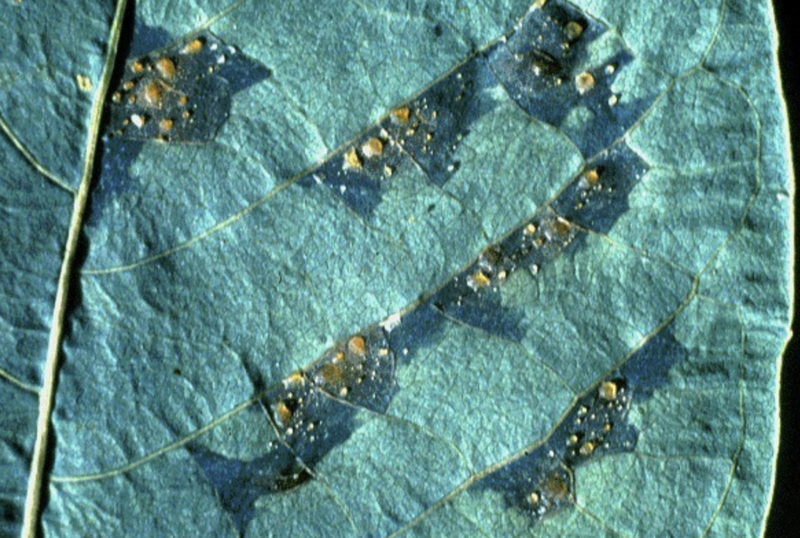 The earliest symptoms visible on cassava leaves are dark-greenish water-soaked areas limited by the leaf veins and which show gummy exudation on the water-soaked areas (Photo CBB 8). The lesions enlarge and eventually coalesce along the veins or edges of the leaf, killing the leaf. The vascular bundles of infected petioles and stems are also necrotic, appearing as brown or black bands. No symptoms of CBB have been recorded on or in cassava roots. 2. What crops does the CBB pathogen infect? The CBB bacterium is capable of infecting most members of the plant genus Manihot which consists of about 100 species. However, from studies in Nigeria and Colombia it has been concluded that the CBB bacterium does not survive naturally in alternative hosts in and around cassava crops. 3. Where does CBB occur? CBB is found throughout the cassava-growing regions in the Americas, sub-Saharan Africa, South- and South-East Asia and in some Pacific Island nations (Guam, Fiji, and the Federated States of Micronesia). 1. How does the CBB pathogen survive in nature? The CBB bacterium remains viable for many months in diseased plant tissues (e.g.the planting stakes and in the seeds), and in the gummy exudate from stems and leaves. In moist conditions, it has been shown to survive for up to thirty months without new host tissue. It survives poorly in the soil but can survive on the surfaces of weeds and in insect feces. 2. How does CBB infection start? The CBB bacterium enters its host plants through leaf pores (stomata) and through wounds in leaves and stems. 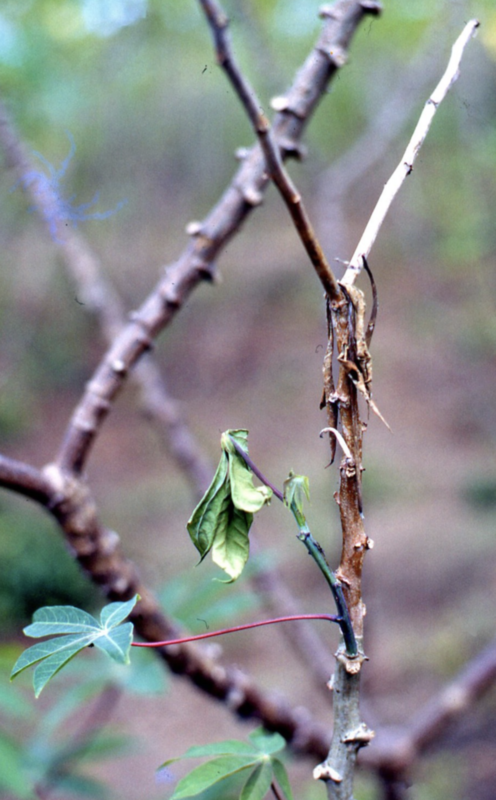 Wounds can be caused by insects (e.g.Pseudoteraptus devastans has been implicated in the spread of the disease in cassava in Africa) and human activity (e.g. the picking of young shoots for use as a vegetable, or damage while weeding). 3. What happens when the pathogen infects? Once inside its host, the bacterium dissolves barriers to the plant’s vascular system and begins a systemic infection, moving through the plant in the xylem. In this way, the pathogen invades younger tissues such as developing leaves and seeds, disrupting water flow and thus causing the characteristic wilt of the leaves and young shoots. 4. How is the disease spread? Once one cassava plant is infected, the whole crop is put at risk to infection from plant-to-plant transmission through several means, including rain-splash, insect damage, picking off young shoots as a vegetable, and contaminated cultivation tools. The distribution of infected vegetative planting material of cassava from diseased plantations has been the main means of disseminating the CBB bacterium over long distances into Africa and Asia. It is also the source of primary infections in newly established plantations. This is due to the ability of the pathogen to survive in invaded tissue for a very long time and the lack of visible symptoms on lignified stems makes it difficult for growers to know if they are using diseased planting material. 5. Is the pathogen seed transmitted? Infected seeds are an important means of transmitting the pathogen to new crops or regions. 6. Does the CBB pathogen show pathogenic variability? Pioneering research on isolates of the CBB pathogen from various African countries and their comparison with isolates from Latin America and Asia was carried out by Professor Henri Maraite and colleagues at the Catholic University of Louvain. They concluded (Maraite et al., 1981), based on significant differences in virulence, that pathogenic specialization did occur. 7. What is the significance of pathogenic variability? It is vital that new cultivars are thoroughly tested in the field in regions where they are to be introduced, so that the new cultivars are exposed to the full range of pathotypes existing under a range of environmental conditions. Because of differences in aggressiveness among isolates of the CBB bacterium it is advisable to take measures limiting the spread of the aggressive strains through the application of quarantine measures. 8. How is the CBB pathogen detected in seeds and stems? • streak onto the surface of special semi-selective agar medium (cefazolin trehalose agar or CTA*) to see if characteristic colonies of the bacterium develop on the surface of the agar medium. *The semi-selective agar medium, designated cefazolin trehalose agar (CTA) medium, contains (per litre) 3.0 g of K2HPO4, 1.0 g of NaH2PO4, 0.3 g of MgSO4.7H2O, 1.0 g of NH4Cl, 9.0 g of D(+)-trehalose, 1.0 (+)-glucose, 1.0 g of yeast extract, 0.025 g of cefazolin, 0.0012 g of lincomycin, 0.0025 g of phosphomycin, 0.25 g of cycloheximide and 14.0 g of agar. In addition, where available, there are specialised laboratory techniques that can be used including serology (ELISA), immunofluorescence, Polymerase Chain Reaction (PCR) and dot-blot assays which are specific, sensitive and rapid. For example, using PCR which amplifies a DNA fragment of 898 bp, the CBB bacterium can be detected to as low as 300 cfu/mL in CBB infected leaves and stems. The specific probe P898, detected the bacterium in raw extracts of infected leaves and stems, and in cassava seed. 9. How can cassava seed/planting material be safely moved without the risk of carrying the pathogen to new areas? In countries or regions where cassava bacterial blight does not yet occur, great care must be taken in the introduction of germplasm to ensure that the disease is not introduced. power until the water temperature reaches 73°C and then immediately removing the water. If a microwave oven is not available, a dry heat treatment for 2 weeks at 60°C is recommended. The vegetative propagating material should be introduced as meristem culture multiplied in vitro and certified disease-free. Details can be found in the FAO/IBPGR technical guidelines for the safe movement of cassava germplasm. 10. What is the CBB disease cycle? 11. What are the key points of CBB biology and epidemiology? • CBB is caused by the bacterium Xanthomonas axonopodis pv. manihotis (Bondar) Vauterin et al. 1.1 What is host-plant resistance and does it exist for CBB? 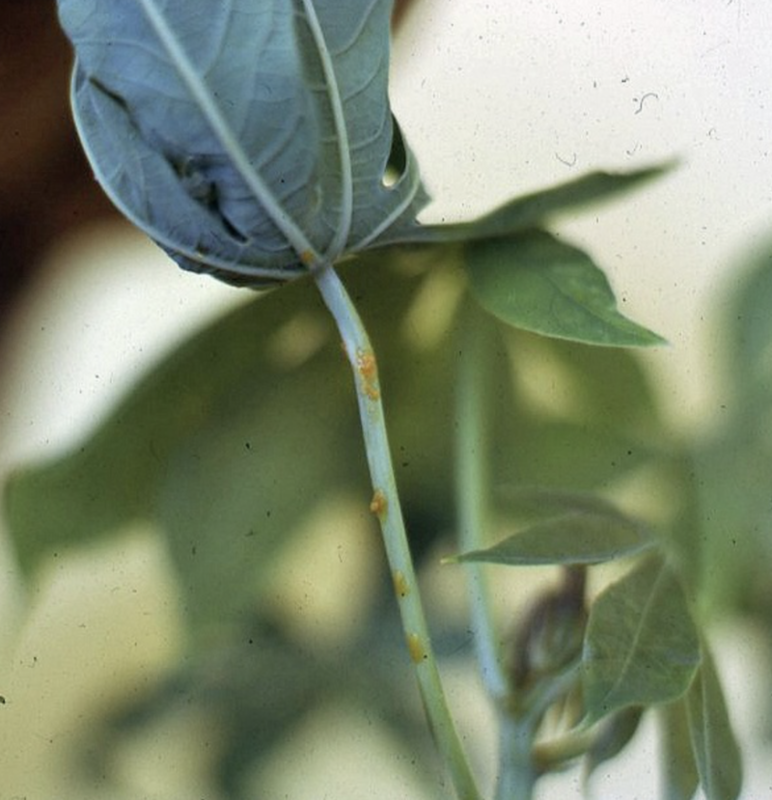 Host-plant resistance is the ability of a plant to resist become diseased when challenged by a pathogen which is able to cause disease in other plants in that species. Host-plant resistance can have various mechanisms which are conferred by genes within the plant. Clear differences in host-plant resistance to CBB occur, especially with regard to stem infection and wilt. The use of CBB resistant cultivars is a major control strategy. 1.2 How is host-plant resistance to CBB detected under field conditions? Screening for resistance to CBB can be carried out under field conditions, either a) by direct inoculation of the test cultivars with suspensions of the CBB bacterium (by leaf spray and or stem inoculation) or b) by exposure of the candidate test cultivars to natural sources of inoculum in areas where the disease is endemic and occurs severely and regularly. In order to detect stable sources of resistance, candidate cultivars need to be tested across a wide range of environments in areas where the disease is known to occur severely. 1.3 Can resistance to CBB be identified in the laboratory or glasshouse? 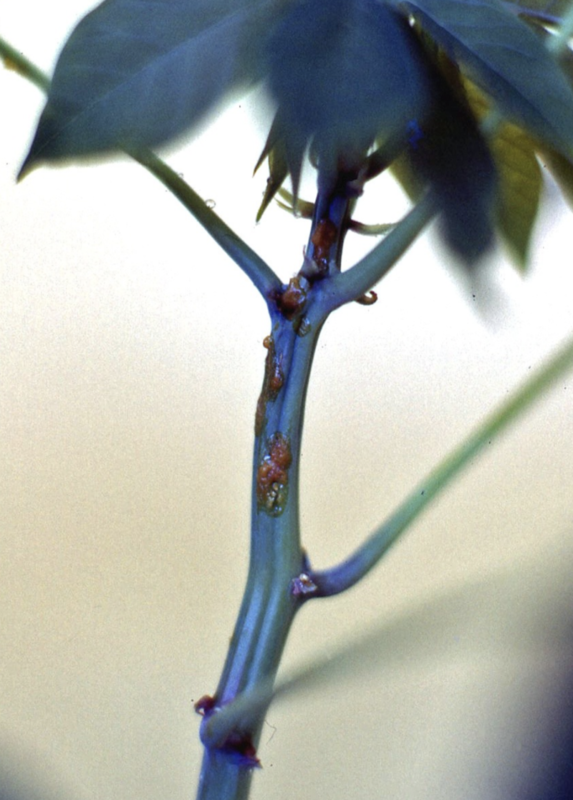 Screening for resistance to CBB can be carried out in the laboratory and greenhouse by spraying suspensions of the causal bacterium onto leaves and by inoculating the bacterium into stems. 1.4 What progress has been made in finding and using host-plant resistance to CBB? CBB resistant cassava varieties have been detected in many international and national cassava improvement programmes. Information on the sources of resistance identified by the CGIAR Centres IITA and CIAT is available from the cassava programmes of these institutes. 1.5. Has the genetic basis of CBB resistance been elucidated? Considerable progress has been made in understanding the genetic basis of resistance to CBB. Resistance to CBB is believed to be polygenic and additively inherited. Differences between resistant and susceptible varieties are expressed as a variation in the rate of colonisation by the pathogen and penetration of vascular tissues. Hence, resistance is considered to be quantitative. Because of the quantitative nature of resistance, a strategy based on detecting quantitative trait loci (QTLs) has been developed to use the available cassava genetic map to identify those genomic regions involved in resistance. These regions are also known as quantitative resistance loci or QRLs. 1.6. What is known about the mechanisms of CBB resistance? Various mechanisms of resistance to CBB have been postulated, including the production of phenolic compounds, lignin deposition, copious latex production containing protease, ß-1,3 glucanase, and lysozyme activity. 1.7 Have sources of resistance been identified that are effective at locations throughout regions and across continents? National agricultural research has identified broadly effective resistance in several countries, e.g the cassava genotype TMS 30572 has been recommended for farmers in Benin because of its high yield and relatively stable resistance to CBB across different environments. There are no reports of international CBB resistance nurseries to identify resistance across broad geographic areas and diverse environments. 1.8 From where are CBB-resistant cassava varieties available? Information on the sources of resistance identified by the CGIAR Centres IITA and CIAT is available from the cassava programmes of these institutes. The national agricultural research and extension services of many cassava growing countries will also be able to provide information on effective sources of resistance to CBB and also on the availability of planting material of these resistant cultivars. 2. The use of bactericides, antibiotics and biocontrol? 2.1 Can treatment with bactericides or antibiotics control CBB? Whilst probably feasible under laboratory conditions to control CBB by the application of bactericides and antibiotics, there is no practicable use for such control measures in the field in farmers’ cassava crops. 2.2 Which biocontrol agents are effective and practical as treatments for CBB control? Foliar application of Pseudomonas fluorescens and P. putida has been reported to significantly to reduce leaf infection by X. axonopodis pv. manihotis. However, biological control is not yet a practical reality. Knowledge is the key. If farmers have information on the nature of the factors adversely affecting their crop, how these factors damage the crop and what is known on how to reduce the damaging effects, then the farmers will be able to find ways that work for them, using the resources available to them within their operating environment. This leads to locally-effective and achievable Integrated Pathogen Management (IPM). Knowledge of the biology and epidemiology of CBB, its life cycle and means of control are key factors. 3.2 What actions can farmers take to reduce the problem of CBB? a) Ensure that the planting material is free from the CBB pathogen The most important action that farmers can take to prevent the disease from starting off in the crop is to use disease-free planting material; great care must be taken in collecting cuttings only from healthy plants and from the most lignified portion of the stems, up to 1 m from the base, combined with visual inspection for the absence of any symptoms including browning of the vascular tissues of the stem cuttings. Ideally, cuttings for planting should be taken only from plantations that have been found to be free of the disease. If it is unclear whether the planting material is pathogen free the planting stakes can be: i) immersed for 10 min in a solution of cupric fungicides such as copper oxychloride or Orthocide® (captan) at 3 to 6g/L. ; or ii) heat treated using water at 49 °C for up to 5 hrs, which has has been found to significantly reduce the incidence of CBB from diseased stakes. Treatment with hot water does not, in practical terms affect stake germination, reducing it by only marginally in the most prolonged treatment. b) Minimise spread of the disease within the crop If the disease is detected during the growing season, secondary spread within the crop can be reduced by immediately removing the infected leaves and stems and burning them, making sure that there is no contact between the diseased material and remaining disease-free plants. Tools should be regularly disinfected, by heating in fire or using a bactericide such as chlorox to prevent spreading the CBB pathogen while weeding. c) Intercrop cassava with other crops to reduce inoculum spread Intercropping of cassava with maize, sorghum and cowpeas has been found to reduce CBB levels in susceptible cultivars. d) Employ sanitation methods and crop rotation All infected plant debris and weeds on which survival of the pathogen may occur should be removed and burned or incorporated into the soil. Crop rotation and fallowing can also be useful to prevent disease initiation in a new crop that is planted with disease-free cuttings. Rotation or fallowing should last at least one rainy season. e) Avoid nutrient-depleted soils and improve crop nutrition In potassium-deficient soils, increasing the potassium content of the leaves by fertilisation has been found to reduce disease severity. 3.3. How can farmers increase levels host-plant resistance to CBB in their local cultivars? Cassava resistance to CBB is highly effective in minimising damage caused by the disease. The use of resistant parents in hybridisations combined with simple phenotypic field selection under high natural disease pressure should effectively improve resistance of cassava. The continual selection of new planting material from disease-free plants can contribute to local build-up of CBB resistance. 3.4 Why is community action beneficial for the control of CBB? Integrated pathogen management will be more effective if done on a community basis rather than by individual farmers acting alone, as the CBB pathogen can be carried to and from neighbours’ fields. The basis for effective on-farm actions is for all the farmers in the community to fully understand the biology and epidemiology of CBB and work together to reduce the levels of the disease. 3.5 What are the key elements for Integrated Management of CBB? This reference section provides key sources of research information that informs & supports the statements and suggestions given. Priority is given to references that are available via the internet and which provide access to a rich source of other relevant references. 5. Maraite H.,Wayne, J.,et al. 1981. Physiological and pathogenic variations in Xanthomonas campestris pv. manihotis. Proc. Fifth Con. Plant Path Bact. Cali 1981.